THE FALLS of this market town are one of its finest features. They can be viewed from the bridge or, better still, from the footpath or river-side walk which can be entered through the archway leading off Main Street. In 1959 the owners of the Falls Hotel generated an electrical supply from their own hydro-electric plant. This was adapted in such a way as to suit any water level in the river. THE TOWN HALL: The first town hall in Ennistymon is commonly referred to as the "old hall". It was assembled from corrugated iron sheeting previously used in workmens huts in Doonagore Quarries, Doolin. The quarry firm, Watson & Co., had closed the quarry due to an industrial dispute and the huts were bought about 1908 by a committee in Ennistymon headed by John Roughan, who dismantled and rebuilt them as the Town Hall. Prior to this, entertainment activities in the town were held in the Market House and Courthouse. The Hall served the town well for over ten years until that dreadful night of September 23rd 1920 when , together with many houses in Ennistymon, the Hall was burned by British Forces. The second Town Hall was built in 1924. It was funded by local contributions, and �500 compensation for the burning of the previous hall was paid by the British Government. Though small in size, it was a major centre for entertainment throughout the 1930s, 40s and 50s, with dances, concerts, films, musical shows and operas all being staged. The billiard room was the home of a very popular social club. The arrival of more modern places of entertainment elsewhere in the 1960s and 70s resulted in the Town Hall being little used . Major structural defects developed in the building and a decision was made in the late 70s to replace the Town Hall with a more modern leisure complex. In 1982 the building was demolished to make way for Ennistymon Parish and District Community Centre now standing on the site. 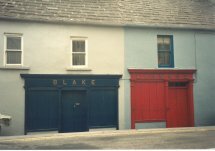 THE SHOPFRONTS of Ennistymon have featured in books, posters and calendars over the last few years. They play an important part in the Irish vernacular tradition of town architecture. Each front has its own distinctive colours, giving the street facade a character all its own. CHURCH HILL takes its name from the old Protestant church built on its summit in 1778. This unadorned nave and chancel church fell into ruin soon after the new church, St Andrews, was built in 1831. The view over the town and surrounding countryside is spectacular. The church and graveyard preside over the town from their grassy eminence. The newer Protestant church is on Church Street and the modern Catholic church above the Lahinch Road was built in 1954. ST ANDREWS CHURCH is in the style of the English gothic churches and was designed by a Mr. Cooney from Northern Ireland. The tower was added shortly afterwards using the same masons. In 1986 the Church of Ireland Representative Body gave St. Andrews to the local branch of Comhaltas Ceoltoiri Eireann as a Cultural Centre. The TEACH CEOIL, as it is known, now houses the headquarters of this group. THE SQUARE dividing into Church Street from Main Street and Parliament Street, opposite it, leads off towards the back of Church Hill and the cattle mart. The old market house still plays a part in the commercial life of the town. ENNISTYMON GLEBE or Kilmanaheen Glebe on a minor road north of Ennistymon is a fine rectory built by the Rev. James Kenny, a convert from Roman Catholicism in 1787. The nearby trout stream is still called Tattans River after another incumbent who succeeded Kenny. KILMANAHEEN CHURCH, St. Manchins church, to the north of Ennistymon was once the parish church for an area of over 8,500 acres. It is now a barely discernible ruin with a graveyard, its old importance long forgotten. Before the church was built, the dun, or residence, of Baoth Bronach, King of Corcomroe, stood here until he gave the site to St. Manchin. GLEN CASTLE is situated on a low hill west of the road to Ennis. Sir Daniel OBrien was listed as the proprietor in 1580. It stands within the old parish of Clooney, the church of which was "well ruined" when visited by James Frost at the end of the nineteenth century. Near the church he found a well dedicated to St. Flannan. In Killeighnagh townland he found a small burial-ground and in Mooghna he noticed a little graveyard and a well, "Tobar Mooghna". ENNISTYMON HOSPITAL was once the workhouse and administrative centre for the Union of Kilmanaheen. Today this Palladian-style building is still a hospital but has lost, or buried, its old workhouse image. ENNISTYMON LIBRARY is a spacious, modern building. It opened in 1981 and is situated just off the Square. THE COURTHOUSE had been lying idle for many years after it was abandoned for District Court sittings in the early 1980s due to its decrepit condition. It was saved from demolition through the initiative of a group of local people. The building has been developed as a community resource and is used as an artists studio facility. The Courthouse Studios are located at Parliament Street.